The term "supergroup" is used way too promiscuously, but in terms of Canadian roots music, it seems an accurate tag for the Good Family, who this week mark the release of their debut The Good Family Album. The new group features two generations of Goods, members of the popular veterans Good Brothers and the highly acclaimed Sadies. Joining Bruce and Larry Good (the Good Brothers) are Bruce's sons and Sadies frontmen Dallas and Travis Good. The Sadies rhythm section of Sean Dean and Mike Belitsky are also featured, as are Margaret Good (wife of Bruce) and her niece, D'Arcy Good (daughter of Brian, the one Good Brother not included). As Dallas Good tells it, an album was almost a given at this point. The two generations have collaborated in a performance setting many times over the past two decades, including on Good Brothers and Sadies tours of Britain. "Whenever the opportunity arises, we'll do a show called the Good Family," Dallas explains to Exclaim! "To be honest, they are sets largely or almost entirely comprised of cover material. Borrowing a little from the Good Brothers and the Sadies but generally pretty generic." 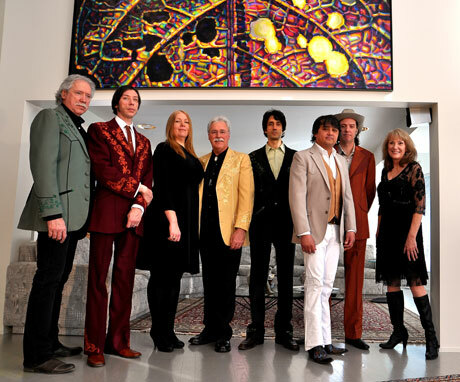 The three Good Brothers (Bruce, Brian and Larry) and Margaret all guested on the Sadies' 2006 live double album, Vol. 1. For the official debut of the Good Family, however, it was decided that the members should come up with original material. As Dallas Good observes, "No one needs another generic May the Circle Be Unbroken album." As album producer, Dallas rather took the reins, co-writing with and encouraging the other family members to come up with songs. "It was nice to give everybody a fair shake at writing, without over-exerting anybody," he says. Greg Keelor co-wrote a couple of the tunes, and Daniel Romano collaborated with Dallas on "Life Passes (And Old Fires Die)." A notable cast of those also working on the album included Michael Timmins (mixing) and Peter J. Moore (mastering), as well as Don Pyle, Saam Hashemi and Guillermo Subauste. "For the first three-quarters of making this record, it was entirely self-financed," says Dallas. "We cashed in as many favours as we could." The logistics of scheduling everything was a challenge also, explains Dallas. "There was one day in particular, where I was working here at home with Guillermo, Michael was working at his studio on the mix to another song, and Don was recording my father and uncle, just up the street from me. It was definitely a melting pot of studios. The record ran a little overtime, digging into making the Sadies album for a bit." You read that right: Dallas Good is currently mixing a new Sadies album. The keenly awaited follow-up to 2010's Darker Circles is slated for a mid-September release. Dallas self-deprecatingly describes it as "more of the same crap. It has been a long time since our last record came out. We've used the opportunity to get to know the songs a little better before pushing 'record.'" As previously reported, the band are handling production duties themselves, though longtime collaborator Gary Louris (the Jayhawks) has been involved. "He came in basically to help with the vocal performances and occasionally with the lyrics, even the melodies and harmonies," says Dallas. "He helped my brother and I reach the confidence level to deliver a little more than we would without him." The Good Family are currently rehearsing for their imminent album release shows at Toronto's the Dakota (May 9 and 10), the Starlight in Waterloo (May 30) and the Casbah in Hamilton (June 1). Summer festival dates include Sudbury's Northern Lights Festival on July 6. The Good Family Album is out now on Latent Recordings.